Rustic table crafted from reclaimed pine features three pull-through drawers and a lower storage shelf atop 360-degree locking casters. 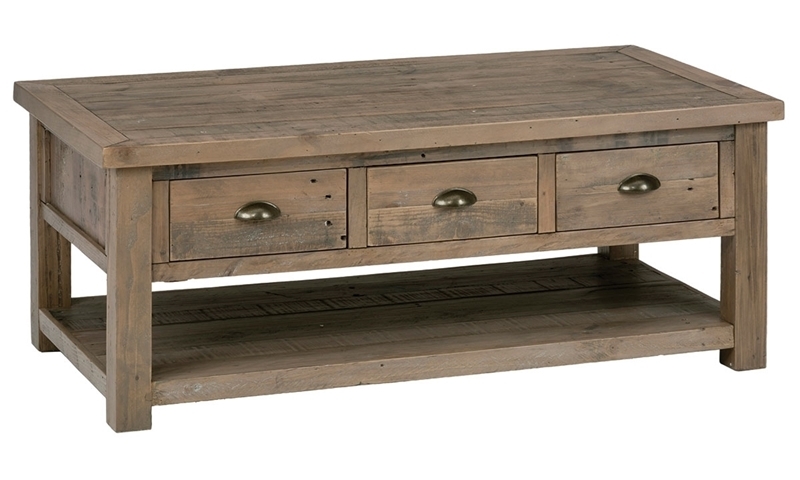 Update your living room with the antique look of the Slater Mill cocktail table. This piece is crafted from reclaimed pine that’s been washed and treated with a 9-step waxing process for charm and durability. Each of its three drawers is accessible from both sides of the table, topped with metal cup pulls for industrial detail. Easily reposition or lock this cocktail table in place thanks to the casters beneath its lower storage shelf.